The dockXtender for Lightning devices is a next-generation dock extender cable for iPad, iPhone, and iPod. This 2 ft long male to female Lightning extension cable is compatible with all new Lightning-equipped iPad, iPhone and iPod models (like iPhone 7, Plus, iPad Pro, & more). 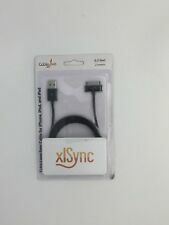 Works with all iPhone, iPod, and iPad models (except iPod shuffle).